After a couple of days stuck in with a cold, I became slightly obsessed with getting down to the seaside or the estuary. Still suffering from post-viral achiness and not wanting to tempt the weather gods, we chose a trip to Egypt Bay. There is a named walk - something to do with smugglers and curlews and well signposted - that takes you across the marshes to the Thames Estuary, between the Isle of Grain and Cliffe, down Decoy Lane to Swigshole. (Swigshole! It isn't a figment of Dickens imagination, it really exists.) We walked along the path, sheep on one side, cattle on the other, bright sun in front of us and threatening clouds behind. The place was deserted, the only sound to speak of the crunchiness of the frozen ground and, where the temptation was too much for me to resist, the satisfying crack of ice breaking. Egypt Bay is not pretty. It's one of those places that catches deposits of seaweed and detritus. The tide was high, just becoming slack, marked by that familiar watery sloppiness. There was a narrow peninsula of cockle shells and we sat down to eat a slice of christmas cake, looking across towards Canvey Island. I actually saw three ships go by; no sails though just containers. No laughing frogs. No curlews either, with the high tide. Pity - I love the sound of curlews. 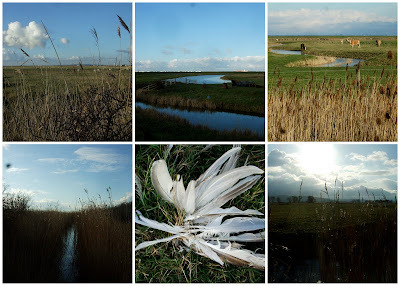 We walked along the sea wall a little way, then turned back across the marshes and picked our way back through the dykes. Little flocks of goldfinches appeared now and then. The thorns on the wild roses seemed particularly brutal. Even the gate posts seemed to be unecessarily heavily barbed. It was on the drive home that we passed the end of Christmas Lane. I'm sorry to hear you were sick. Hope you are all better, now. Who can resist, when the ice is like that? I remember MrH driving me out to take a walk many years ago, after I'd been very ill. I can even recall what I was wearing- it made such an impression on me. On the subject of place names...when I was small my Dad anounced that we'd be going to Trearddur Bay for our holidays. Mum thought it was somwhere exotic. Turnrd out to be Wales as usual! 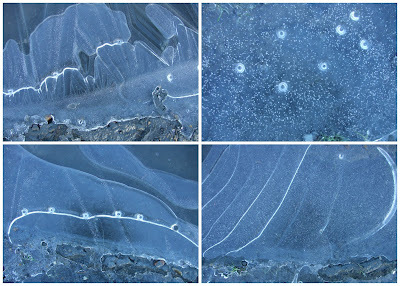 Liking the photos, especially the ice ones! What lovely photos and placenames. I am captivated! I hope you are feeling much better now ....stay warm. The perfect walk and most welcome pictures because we are still village-bound (fifth day and counting) because of the snow. Am rapidly running out of nearby fields to give the hound some variety on his twice-daily walks. Love the sound of curlews and am very fond of goldfinches. Here we have an abundance of the latter because I put out quantities of nigella seed each day. They go bonkers for it and I counted 14 of them on the terrace earlier this week. But nigella supplies running low and no idea when the bird food delivery van will make it up the icy hill into the village! What lovely evocative names! I envy you the walk, although the cold was surely biting in those exposed parts of the estuary. There seem to be a lot more goldfinches around this year than ever before, I wonder why. Not that I'm complaining, their glorious colours bring some welcome winter cheer. That sounds like a magical walk with those fabulous names. But where is the snow? We are still snow and ice bound on the North Devon coast. It might not be pretty, but your photos are! Love the ones of the ice. And I'm glad to hear you're feeling a bit better now. I love your photographs. And that Christmas cake looks pretty good, too. I've been hankering after some sea air and we might just get some next week.